One-third of African American families taking out PLUS loans earn less than $30,000. Photo credit: Shutterstock. Families take out parent PLUS loans after children hit their limits on more affordable student loans, which can create burdensome levels of "intergenerational debt"
By making loans to borrowers without evaluating their ability to repay, then pursuing those who default into bankruptcy court, garnishing their wages and social security checks, and seizing tax refunds, the government may be engaging in "predatory lending practices." 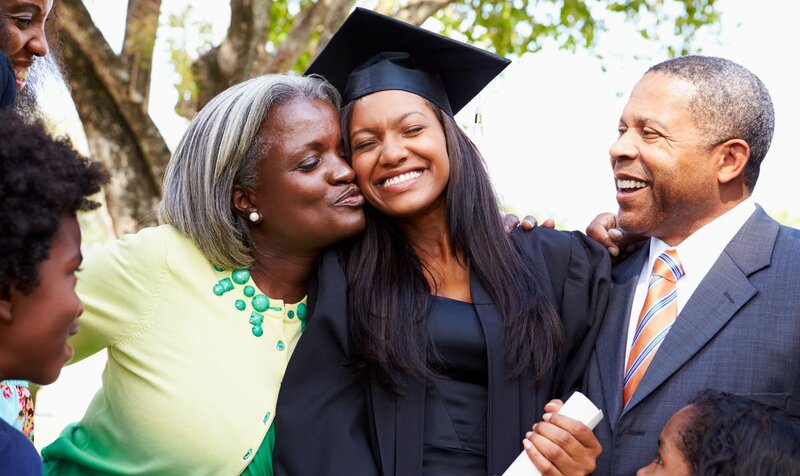 With generous loan limits, limited underwriting, and the highest interest rates and fees of any federal student loans, parent PLUS loans have a reputation in many circles as a loan of last resort. 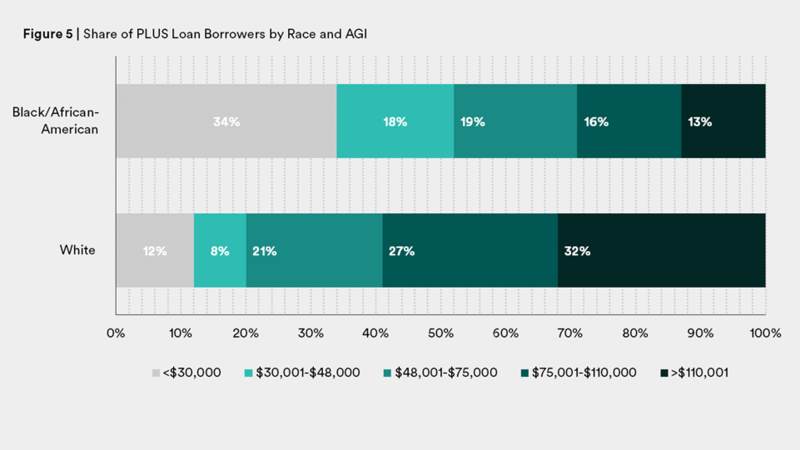 But parent PLUS loans are particularly risky for African American families, who are more likely than whites to be saddled with “intergenerational” debt that’s beyond their ability to repay. That’s according to an in-depth analysis by the left-leaning, Google-funded think tank New America, which recommends making parent PLUS loans off limits to all families of modest means. To make up for that loss of funding for college, the study recommends increasing limits on more affordable federal loans for those families. Originally designed for relatively affluent, middle- and upper-income borrowers who may not qualify for need-based aid, parent PLUS loans are more popular than ever, with 854,000 borrowers taking out $12.4 billion in loans last year, the study said. Most parent PLUS borrowers come from families making more than $75,000. Among white families, the higher the income, the more likely it is they’ll turn to PLUS loans, New America found. Only about 10 percent of white families relying on PLUS loans earn less than $30,000, while about one-third earn more than $110,000. But it’s the other way around for black families, with one-third of those taking out PLUS loans earning less than $30,000, and one in 10 making more than $110,000. Source: “The Wealth Gap PLUS Debt: How Federal Loans Exacerbate Inequality for Black Families,” New America. That’s a problem, because not only does the government make no attempt to evaluate the ability of borrowers to repay PLUS loans, the only limit on how much they can borrow is the school’s cost of attendance, minus other aid received. (One of Hillary Clinton’s rivals for the 2016 Democratic Party’s presidential nomination, Martin O’Malley, famously took out $340,000 in PLUS loans for his two children, the report notes). Although the average amount of parent PLUS loan debt taken on by all parents over the 12 years studied was $20,343, that understates the burden of “intergenerational” debt taken on. Parents usually take on PLUS loans only after their children have hit their limits on more affordable loans. The average education debt taken on by the students themselves was $17,307, for a grand total of nearly $38,000 in intergenerational debt. The more income they have, the more intergenerational debt families take on. But even lowest-income families have intergenerational debt approaching $27,000. Repaying parent PLUS loans can be challenging, since they carry the highest interest rates (7.60 percent for borrowers whose children are attending school this fall) of any federal loan. After taking into account an up-front disbursement fee of nearly 4.3 percent, the annual percentage rate (APR) on PLUS loans exceeds 8 percent. Parents who are relatively well off are often able to refinance PLUS loans at lower interest rates. But for those who are struggling to make their monthly payments, there are fewer repayment options than with other federal loans. The only income-driven repayment (IDR) plan available to parent PLUS borrowers is income-contingent repayment (ICR), the least generous of IDR plans. To qualify for ICR, parent PLUS borrowers must convert their loan into a federal Direct Consolidation Loan. The minimum monthly payment in an ICR plan is 20 percent of disposable income, compared to 10 or 15 percent in other popular plans, and borrowers typically won’t qualify for loan forgiveness until they’ve made 25 years of payments. Stretching out payments in an IDR plan can lower a borrower’s monthly payment, but does not provide a lower interest rate. That can add up to a significant increase in total repayment costs — particularly for borrowers who don’t end up qualifying for loan forgiveness. Statistics for parents are hard to come by — “practically nothing is known about parent PLUS repayment outcomes,” says New America’s Rachel Fishman, the report’s author. But there’s plenty of evidence that African American students are “experiencing a true student loan crisis,” based on elevated default rates after they leave school, she says. One in four African Americans who earn a degree ends up in default, compared to 9 percent of borrowers with bachelor’s degrees overall, the study said. For those who drop out before obtaining a degree, Fishman said, “the outlook is horrific.” That’s particularly true for African Americans dropping out of for-profit schools, with three-quarters of that group ending up in default. The end result is that, for many black families struggling to overcome the wealth gap created by discriminatory housing and lending policies, federal student loans often only serve to exacerbate inequality, the study concludes. Given that those loans can’t be discharged in bankruptcy, and that the federal government has the power to seize tax refunds and garnish the wages and Social Security checks of borrowers who default, “the Parent PLUS loan is becoming predatory for black PLUS borrowers who are more likely to be low-income and low-wealth, and who will likely struggle to repay,” Fishman says. As a short-term fix, the New America study recommends making parent PLUS loans off limits to the neediest families. Instead of offering their parents PLUS loans, the Department of Education should let students who come from needy families borrow more themselves. If a dependent student’s expected family contribution to their college costs is zero (because their need is so high), they should have the same total borrowing limit as an independent student — $57,500 in total, the study recommended. That’s $26,500 more than the $31,000 total borrowing limit for dependent undergraduates. Those are all near-term fixes, with even more ambitious long-term policy changes needed, Fishman says.